MacLean Lane is a BEAUTIFUL luxury vacation retreat home. Located in the heart of Nantucket. Close to beaches, bike paths, and town. Walk to some of island's best restaurants. Fall out of bed onto a bike path to take you to 3 beaches. Lush and private backyard. - Echeck is preferred rental payment option. Beautifully appointed with attention to detail, this house has it all: Subzero refrigerator, Viking oven and range, flat screen TVs, marble bathrooms, wet bar, rain shower heads, heated towel racks, granite counters, custom cabinetry, air-jet tub, heated floors, travertine walls, HD cable, wireless internet....NO EXPENSE WAS SPARED! The house SLEEPS 6 people with plenty of room to dine, entertain and relax in your own vacation paradise. There are 2 bedrooms downstairs with 2 full baths, an office and upstairs is the master bedroom suite complete with the amazing master bathroom. Off the back, there is a large deck that is perfect for grilling, a HUGE YARD that just begs to be played in, and a large hedge row that ensures your privacy. Gates at either end of the backyard prevent curious children from venturing outside the yard! Your dream vacation home is in the PERFECT LOCATION near Surfside, plus 3 other gorgeous beaches, but still close to the historic town, the ice rink and central shopping district. Just down the road is a great coffee shop, a fabulous lunch carryout and a bike rental that will even deliver your rented bikes all on the way to the beach! With this location, you don't need a car to get anywhere on the island! Just hop on the Surfside bike path. Stroll into town for dinner at a 5 star restaurant or bike to the beach to swim, fish, tan, or surf some epic waves. 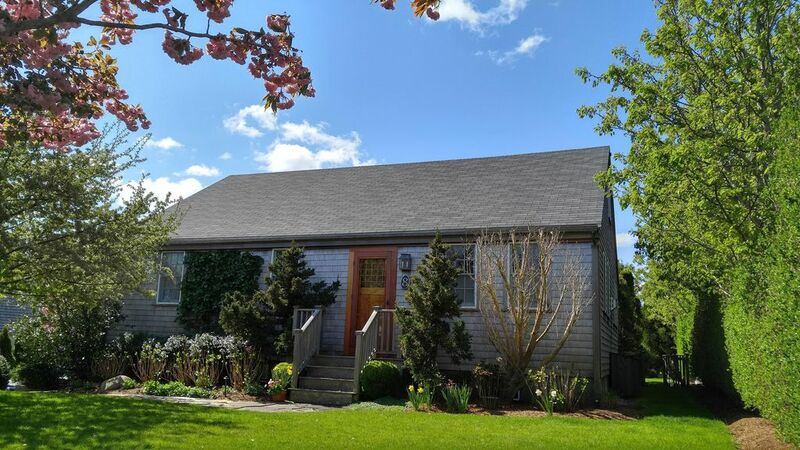 Whether you are looking for a memorable vacation with the family or a place to get away from it all, 8 MacLean Lane on Nantucket Island is your IDEAL RENTAL HOME. And although we love animals, no pets are permitted. Entertaining? You'll love the wine cooler, grill, big deck, wet bar and flat screens. Bringing the whole gang? You'll be thrilled at the sunny, open floor plan and private sleeping quarters for the guests. Please, contact us today to learn more about this amazing property. On January 1, 2019 the State and town are assessing bed taxes on seasonal rentals. We are working hard to understand their impact- please email us to confirm ‘19 rates. Nantucket Island is special....your vacation home should be too. For 30 years, we have been enjoying Nantucket. Our kids grew up fishing, clamming, scalloping here. we love the island in any season starting with Daffodil Weekend in late Spring when every nook and cranny is filled with the bright flowers to Christmas Stroll in early December. We love to share in the intensity of renters' fondness for this most special place and hope the house serves as a great jumping off spot for most special vacations. Centrally located, there are so many extras one would not expect from a summer rental. We know as we rented for years in a dark, moldy, one bathroom cottage with thin mattresses and linens that weren't changed in 15 years! The experience here with heated bathroom floors and top of the line appliances, bath fixtures and very pretty yard is one we hope just ameliorates our renters' experience on Nantucket. Our goal is a special home for your holiday! toilet, shower, Skylight in shower offers 3 selections of water flow! Plenty of room for 4-5 cars! Wide range of beach dishes and bone china! Custom-made cabinets. Granite counter top with sink window looking out on the backyard lets the noon time sun flood the kitchen!. Comfy basement seats 6 and has tables and board games and cards as a wet bar. Beautifully-manicured lawn surrounds the house which has dense blue hydrangea bushes in the front and a wall of different fir trees providing total privacy in the back yard. We stayed at 8 MacLean with our two kids (4 and 2.5) at the end of August. The property was perfect for our needs. The central location was ideal for trips to the beach, Cisco or Town, and the house provided a perfect home base for relaxation. The house was very clean and comfortable, and well stocked with everything we needed; it's clear that the owners take a lot of pride in the place. The owners were also incredibly responsive to any questions we had. This is a great property! Thrilled to hear that the house and its location met all your needs! We work hard throughout the winter to ensure every part of the house, the linens, kitchen utensils/appliances, the beach 'stuff' is all in perfect shape for our tenants and therefore, we appreciate you noticing! You too were 5 star tenants and we hope you return to the Mid-island/Surfside Beach part of Nantucket. Our family of 6 with three kids and three adults had a blast staying in this wonderful, classic Nantucket home. It's the perfect distance from town center, the supermarket, and all the great beaches. Just far enough away from the hustle and bustle of town but only 5 minutes away by bicycle or bus. The bus stop is 3 houses down the street. Also very nearby are a great breakfast eatery and upscale wine and beer shop. But best of all, the home itself is just a perfect place to spend some time in between visits to the beach. Very well apportioned and comfortable with private spaces for everyone and a great front and back yard. We can't wait to visit again! Oh do please come back! And so glad you found the central mid-island location a plus. You could eat 7 nights a week at a different and terrific restaurant mid-island. We love to pickup lunch at one of the several take-away spots near the house and then bike to one of the many beaches close to the house. Yet so glad to hear you also enjoyed just hanging at the house. We agree with our tenants that the tall trees that form the backyard perimeter make it a very private spot to read or snooze! Thank you for the review and for staying at 8 MacLean. We enjoyed our time at 8 MacLean. Very well kept house on nicely maintained property with privacy. Very well kept home on nicely maintained property in a very convenient location. The house is as advertised with plenty of amenities, nice new appliances and just about everything you might need. It was a warm week so the bedroom air conditioners came in handy. The house is conveniently located with short easy rides to some of the beaches and town. Grocery store and some restaurants are within walking distance and our kids took advantage of the ball fields and basketball court at the schools not far away. We spent a lot of time on the deck in the backyard enjoying the pleasant evenings. Property owner was very responsive to answer any questions we had and we definitely felt like they were committed to providing us the best experience possible. We had a great week and would certainly go back to 8 MacLean. Thank you very much for the review! We are so glad to hear you enjoyed the house and private yard plus the neighborhood amenities during your stay. Yes, the convenience of the public schools property plus the year-round ice skating rink all across the street are real pluses. Please come back! 8 MacLean was an outstanding Nantucket rental. The location is convenient to town, multiple bike paths and beaches. The house is beautifully decorated with plenty of space for 2 adults and 2 teenagers, and all of the amenities were in great shape. The place was spotless, Chris was very responsive and helpful, and we had a great week. There are two wonderful breakfast/lunch places very close to the house, and the deck and back yard were very private and spacious. Made for a very relaxing week! So happy to hear that you enjoyed the house and it's central location. More importantly, that you had a great vacation week! We have rented houses on the island years ago that were dark and dingy, had stained couches and old appliances and it really impacted our vacations. I want my renters to have a completely opposite experience! And yes, those bike paths are really terrific offering access to several beaches and mid-island where shopping and at least 5 great restaurants are located. Plus early morning bike rides to Downyflake for their famous donuts is a breeze! Please come again. Beautiful home and yard, well appointed and maintained. Our family loved this home. The house is nicely decorated with updated appliances, bathrooms and comfortable beds. We especially enjoyed the backyard, deck and outdoor shower! Centrally located on the island with easy access to downtown and beaches. Owners are super nice and very responsive. Overall great experience. We absolutely loved this house and Nantucket! Great location with a wonderful coffe shop down the road! Would highly recommend Erine's taxi if you don't rent a car! Well maintained and comfortable for two couples! Will definitely stay here again! So glad you enjoyed your stay and the house! The new coffee/lunch shop is so good and hope you also easily rented your bikes from the shop near the house as well. Please come again! The house is just off the Surfside bike path that takes one to Miacommet, Cisco, and Surfside beaches. It also leads to the Town of Nantucket, the Cliff area and Jetties Beach. The Town ice rink is right across the street with open summer skate hours and summer camps. The island's largest grocery store is just a short walk away in the central shopping area with fun and yummy restaurants, pharmacy, post office, etc.
. SEASON 2017 rentals are Saturday (3 pm check in) to the following Saturday (9 am check out).The premise is located at 8 MacLean Lane, Nantucket Island, Ma. The TENANT agrees to pay the full rental fee for the term of the lease. Utilities such as gas, basic cable/wi-fi, electricity & trash removal included. The TENANT agrees to pay a cleaning fee of $290.00. In addition, TENANT will also pay a refundable Security/Damage deposit of $ 650.00 as described below, to be held by OWNER, it being understood that said Security/Damage deposit is not to be considered prepaid rent, nor shall damages claimed (if any) be limited to the amount of said deposit. The OWNER herby notifies the TENANT that the OWNER must submit to the TENANT an itemized list of any damages claimed to have been caused by the TENANT and return the entire Security/Damage deposit less damages and other lawful deductions, within sixty days (60) after the termination of the tenancy. It is understood and agreed that the OWNER shall prepare the premises for occupancy and the TENANT shall maintain same in good order for the full term of this lease and vacate the premises peaceably and quietly at the end of the term, leaving it in like condition in which occupancy was taken and ready for the next tenant. TENANT agrees to wash and dry all towels and leave with a load of sheets in the washing machine. The parties hereto, in consideration of these presents, agree as follows: 1. The sleeping capacity is 6 persons and occupancy shall not exceed that. 2. Smoking and pets ARE NOT ALLOWED. 3. The TENANT will be responsible for all damage or breakage and/or loss to the premises, except normal wear and tear and avoidable casualty, which may result from occupancy. 4. The TENANT shall not underlet the property. Primary TENANT must be 27 years of age. 5. 1 Set of keys will be provided: charge for lost keys is $ 50.00/set. 6. A phone call with the prospective tenant is required before booking.